Jim McCracken’s relationship with The Fuller Center for Housing began last year with a regular weekly email from his friends at Adventure Cycling in Missoula, Mont. The email mentioned that some group called the Fuller Center Bicycle Adventure would be rolling through his neck of the woods. McCracken couldn’t join the entire Seattle-to-D.C. 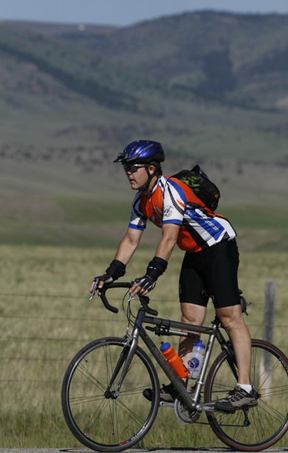 Adventure, but he decided to sign up for a 475-mile segment from Kellogg, Idaho, to West Yellowstone, Mont. That partly planted the seed to form a new Fuller Center for Housing covenant partner in his hometown of Lewiston, Idaho, just 14 miles from the site of daredevil Evel Knievel’s most infamous stunt, the failed “Skycycle” jump over the Snake River Canyon. But the relationships that developed with fellow riders helped seal the partnership that became official Wednesday. Fuller Center Director of International Field Operations Ryan Iafigliola, who rode along with Bicycle Adventure leader Allen Slabaugh for much of the first half of the Adventure, says the connection that led to the formation of the Lewis-Clark Valley Fuller Center for Housing was part of what he had in mind when he created the Fuller Center Bicycle Adventure five years ago. Before the Lewis-Clark Valley FCH begins building at home, McCracken will begin his Fuller Center work in another land that starts with the letter I — India, where he has a friend who is a pastor in the same state as the Trivandrum Fuller Center. He will be doing that very soon as he travels to India April 4-18, about the same time Iafigliola plans to visit operations in that region of the world – in India, Nepal and Sri Lanka. The vice president of the Lewis-Clark Valley FCH is Dave Sinner, who accompanied McCracken to Americus in January for the annual Covenant Partner Conference. “I felt by bringing a Sinner along, I was doing the Lord’s work,” he said with a laugh, noting that it’s easy to laugh at how Sinner’s last name doesn’t exactly match his life of work to help spread the Gospel. The trip to Americus gave them a chance to visit with Fuller Center Director of U.S. Field Operations Kirk Lyman-Barner, who signed the covenant partnership Wednesday morning. The Fuller Center’s first covenant partner in Idaho is the very busy Silver Valley, led by Judy Blalack. Lewiston, a city of 32,000 in the northwest section of Idaho, has a 66 percent home ownership rate, about five points less than the national average. It’s multi-unit rental rate is 21 percent, seven points above the national average. McCracken says that many of the city’s rental properties are substandard, and he would like to help those families become homeowners. And he hasn’t put the brakes on his cycling. He said he intends to recruit about 10 cyclists to join him for the West Coast portion of the 2012 Bicycle Adventure.